"MEET THE MOST TITILATING TIME BOMBS EVER!" 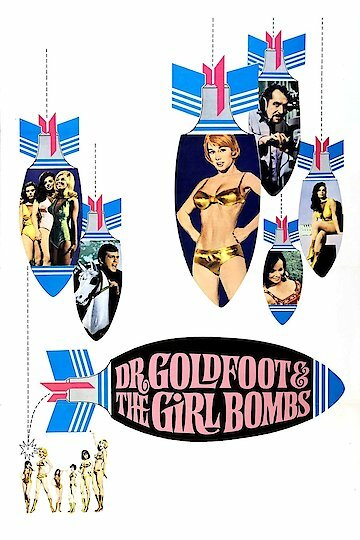 Dr. Goldfoot and the Girl Bombs is an Italian parody film from 1966, focused on the genre of spy films like the James Bond series. A mad scientist has been collaborating with the Chinese government in order to create a fleet of self-destructing robots bearing the appearance of nubile, young women. These robots will be handed off to various generals connected to a NATO war-game, with each one exploding when its general could be killed. The film's protagonist, Fabian, has been enlisted to stop Dr. Goldfoot's plans, provided he can stop chasing after the many attractive women throughout the film. Dr. Goldfoot and the Girl Bombs is currently available to watch and stream, buy on demand at Amazon, iTunes online.